As someone with a degree in Chemical Engineering, I know quite a bit about chemistry. It’s a fun, compelling science. But let’s be honest – it’s also a dangerous one. Things catch fire and explode all the time, and that’s when you’re doing things correctly. These days, getting your science-loving kids to embrace chemistry doesn’t require you to buy a dangerous home chemistry kit and risk your house burning down – there’s an app for that. 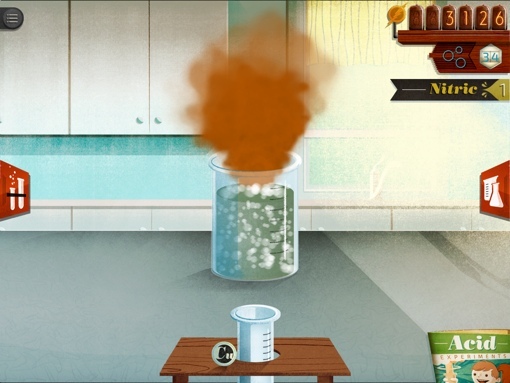 Created by the Chemical Heritage Foundation, the free iPad-only ChemCrafter app is a digital chemistry lab game where kids can safely perform oft-dangerous chemistry experiments. In ChemCrafter, unlocking new chemicals and lab equipment requires you to collect points by successfully completing reactions. Your kids can have a good time mixing chemicals at whim to see how they react with each other and what products they create, if any. To advance, though, they'll will need to follow the game's experiments. Reactions are animated, so they can see that cesium reacts more violently with water than lithium does, and that mixing copper with nitric acid produces a greenish liquid and a dark colored gas. There are even some cool 1950s-style science videos included as bonuses for completing certain experiments. There are a few minor issues with the app that leave me wanting, though. The time gates (generally, 1-3 minutes) in the game are anti-fun, especially for anxious kids – it’d be nice to have an exploratory “sandbox mode” option to turn them off. Further, it seems like the app would have stronger educational chops if it also included the Periodic Table and chemical equations for curious minds to reference. The tutorial also seemed glitchy (a common issue, or so its App Store page seems to suggest), though it can be easily disabled via a Settings toggle. ChemCrafter won't be every child's cup of tea and there are a few bugs, but it's a free app without in-app purchases so there's no risk. There's no harm in having your kids give it a try during the summer brain drain doldrum months. The Chemical Heritage Foundation’s ChemCrafter app is currently available on the Apple App Store for the Apple iPad. Great blog..Good information about chemist app for kids..
Hey! I work with kids and help them to learn more about STEM where as the information available in this blog has helped me a lot in teaching kids. Thanks for your great effort.